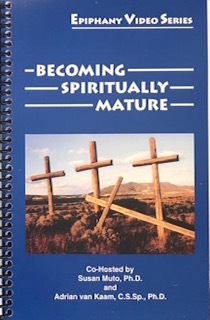 This DVD series consists of six distinct, yet interrelated sequential videos, each lasting approximately forty minutes, which will enable you to share alone or with others what it means to be on the way to spiritual maturity. Co-hosts for this program are Adrian van Kaam, CSSp, PhD, and Susan Muto, PhD. One of Epiphany’s most original resources in the field of adult Christian education and formation today, this series consists of six distinct, yet interrelated sequential videos, each lasting approximately forty minutes, which will enable you to share alone or with others what it means to be on the way to spiritual maturity. The Formation Guide / workbook enables you to follow the six programs in Becoming Spiritually Mature and contains graphics, visuals, and testimonials that inspire viewers to a life of faith deepening and service to others. Co-hosts for this program are Adrian van Kaam, CSSp, PhD, and Susan Muto, PhD. Considers what it means in the details of daily life, to be sourced in God alone; to be distinctively human; to follow the courage of our convictions; to be spirit through and through. Reflects upon the dimensions and dynamics that make us who we are and teaches us to listen in humility to God’s voice speaking in our hearts. Deepens our perspective on existence by showing that we are an entire field of formation with God at the center and shows us how to be more in tune with our unique-communal life call. Explores how God invites us to grow spiritually, even in the midst of a crisis and describes the human struggle we all face in abandoning ourselves to God in utter trust. Meditates on what it means to manifest the Christ-form within us so that we may become, in justice, peace, and mercy, more caring people in the world. Heightens our appreciation of the amazing grace of God in all that we are and do and explains how the spiritual disciplines open us to the peace and joy of true discipleship. $100 (This includes one free guide). Additional guides are $10 each.